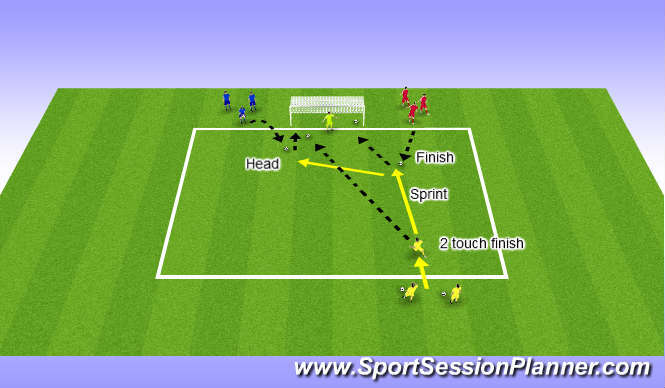 Organisation: Set up a area of 20x20, Split teams into 3, plus a keeper in goal. 1 team (A) are going to be the attackers, with the other 2 teams either side of goal, to become servers, (B) to serve to the attackers feet, (C) to throw ball to the attackers head. Game will start with the attacker having his own ball, he will go for a two touch finish, before running to recieve of (B) then straight onto (C), after attacker has had his 3 attempts at goal he returns to the back of his line and the next man goes. give each team 5 minutes each before they move to the next station, at the end, compare all scores to see who wins.